Some fish, such as South American Characins, take advantage of the fine foliage of the cabomba to lay their eggs, while other partially herbivorous fish graze on it. These plants need good lighting, water that is not too hard, and a more or less neutral pH. For reproduction take cuttings from the side shoots, or from the top. If the light is weak, the water cabomba spreads out on the surface of the water. It grows quickly, unless the water is lacking in carbon dioxide; this means that you must avoid circulating it too vigorously. Size: 30-40 cm. 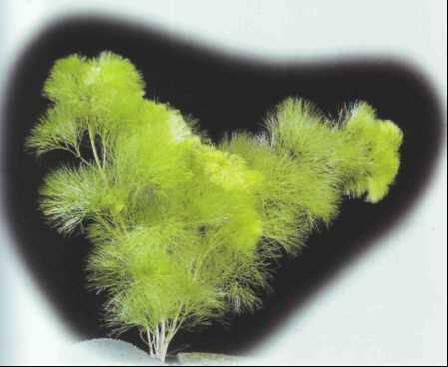 More robust than its cousin, the fish grass or water shield can tolerate temperatures of 20°C but its soil must be fairly rich. 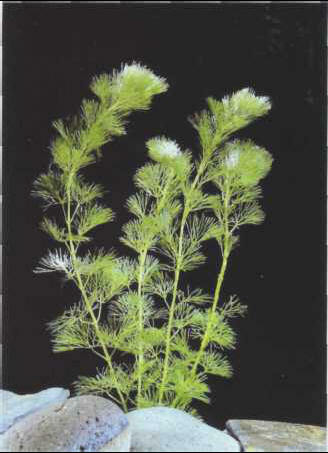 The form of its leaves depends on the conditions under which it is cultivated. Size: 30-40 cm. НЬЮ-ХЭМПШИР (New Hampshire) , штат на северо-востоке США. 24,2 тыс. км2. Население 1,1 млн. человек. (1993). Адм. ц. - Конкорд.